We visited the highlands of Scotland back in the fall and I still think of it almost every day. It was the trip of a lifetime and I cannot wait to go back! If you want to check out my 5 favorite places in Scotland to visit, I blogged about them here. Also follow along on Instagram at @scottishobsession! Leading up to our Scottish vacation, "what to wear" was an ever-present thought in my mind. What will the weather be like? Will my luggage be overweight? What can I pack to wear multiple times? This inner dialogue went on and on. I even searched online for some guidance, but didn't find anything super specific or really helpful. Most "what to wear in Scotland" posts/blogs/info I found basically suggested to take any and everything "just in case" because you never know what the weather might be like. Which is true, but not so helpful when you've gotta keep it under 40lbs. As it ended up, what I packed happened to be right on the money except for a waterproof trench coat that I really did not need. So I decided to put together a list of specific pieces to pack for Scotland in case I can be of some help to future travelers. I would imagine this would apply to Ireland travel and England travel too...especially in the Spring and Fall months. We spent a lot of time outdoors exploring and hiking, as well as castle touring. Layering is definitely a must, as is waterproof hiking boots and multi-wear pants and tops. Check out the shoppable links below the image! BACKPACK // multipurpose pack for all carrying essentials, camera, snacks, etc. This is great! And I love the picture of you at the beginning. The layers say it all. That is such a great pic! Thanks for the post! Thank you so much :) I'm heading to Scotland in August and this will be so incredibly helpful! This is a great wardrobe for outdoor and touristy activities like visiting castles. Perfect catch with the Wellies and vest! I will do that next time I go there. I would add that if you're going to be someplace like Edinburgh and want to go to nice bars or restaurants to also pack one dressy outfit. On one trip we had to bypass some really nice looking happy hours or dinners because we felt completely underdressed. Thank you for posting this! 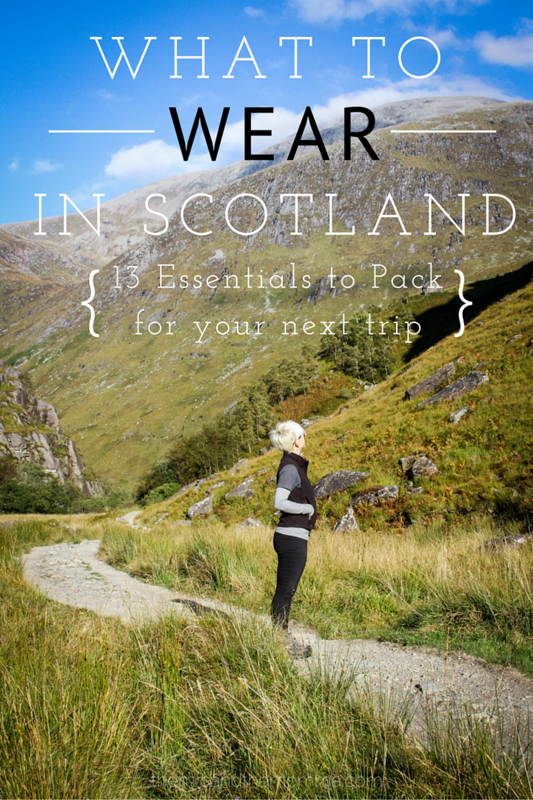 I have been researching on what to pack for Scotland in September and your post is what I am after!